Used in industrial and commercial beer systems. 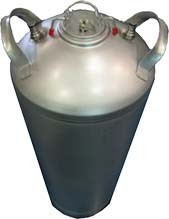 Eliminates the need for gas blending systems or nitrogen generators, Air or CO2 operated (never comes in contact with product), Dispenses up to 3 faucets from a single keg, NSF approved. 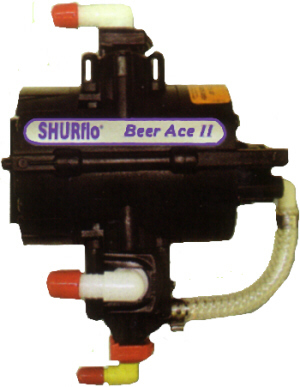 Adds additional pressure to beer system without altering CO2 volumes or introducing new gases to beer. Total Precision of Quality Control by separating CO2 needs and Flow Control into Two Independent Operations. Eliminate Foaming Problems associated with Temperature Fluctuations and Hot Spots by compressing lines up to 70 PSI. Ability to improve Quality Control on current systems that are using CO2 / Air mix or where several CO2 / N2 mix ratios are required. Ability of using smaller I.D. hoses in systems: less beer to cool, less wastage when cleaning, less cost of beer bundles, easier installation.